If you’re looking for high quality vinyl flooring which behaves more like a wooden surface, you’ve probably come across the brand names of Karndean or Amtico. Both brands are well known for their durability, and are highly regarded, but what’s the difference between the two? The first thing you might notice is the price difference. Karndean flooring is usually slightly cheaper than Amtico, so if you’re on a budget, start with looking at Karndean’s pocket friendly options. Starting with an RRP of £60 per square metre, it’s available in a huge variety of wood and stone finishes. 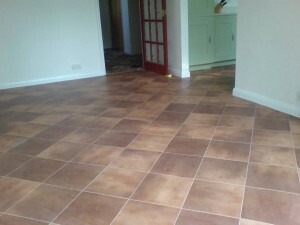 Karndean is supplied in tiles, referred to as “strips”. Karndean sell their own maintenance products for keeping their product in great condition. You can strip the top layer of varnish and have it recoated, and six different types of adhesive for your floor fitter to choose from to make sure that you get the best fit for your floor. Your fitter will need to install it on to a subfloor, as it’s not suitable for installing straight on to concrete, so factor that into your budget. Don’t worry about it being a high maintenance flooring once it’s installed though – a simple mopping (not steam cleaning) will keep it clean. You can even install it over an underfloor heating system. Amtico pride themselves on being the most realistic slate and wood effect tiles on the market, without the stress that a real wood or stone floor would create. It’s very popular if you have pets, because it can withstand claws and scratches. Amtico installation is quite specialised, and it’s a good idea to employ a company who know what they’re doing, rather than attempting DIY. It prefers a plywood subfloor, or wooden floorboards which have been screeded to guarantee flatness. If the subfloor’s not entirely flat prior to installation, you could have problems later on. The room must be within a certain temperature range. Much like Karndean, you can keep your Amtico floor clean with mopping or a vacuum cleaner, and it’s very low maintenance. You won’t get bleaching from the sun as you would with a wooden floor, making it a great choice for sunny rooms like conservatories. Because it’s so strong, it can be used with underfloor heating. Highly regarded by many fitters, Amtico flooring comes with a long guarantee, as long as it’s laid with their own adhesives. For a bit of variety, you can also buy longer strips of Amtico, ideal for making a pattern or design in a feature floor. Whichever option you go for, Karndean or Amtico, Amwick Floors have the expertise to provide and install your floor to give the very best results.